Sometimes food gives you satisfaction, sometimes it gives you solace. Sometimes it kills ur hunger,sometimes it radiates love. Whatever it takes, this “tandoori roti” has always been my favourite restaurant pick from the menu. But after trying it at home for the first time, I realized that I don’t need to plan a dinner date with family or friends and then wait for my order to arrive on our table. 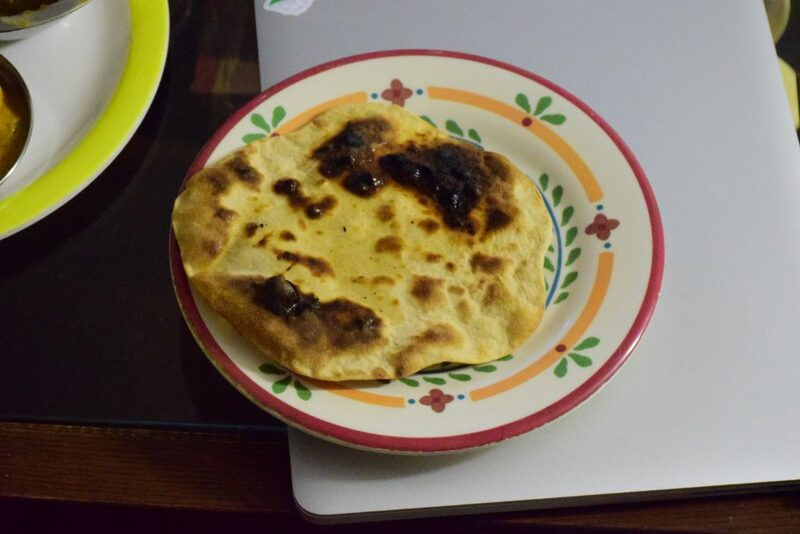 This “roti” would give your dinner a special touch with gentle work. Really , no pains and Full gains !!! I made this for my family and a special friend at home today. Hope you like this doable recipe and try out in your home soon. So lets check it now..
1. Mix the flours in a bowl / tureen (paraat). 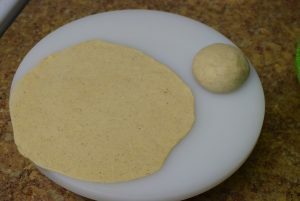 You may use plain maida or plain atta too depending on your preference. 2. Add salt and ghee if desired. 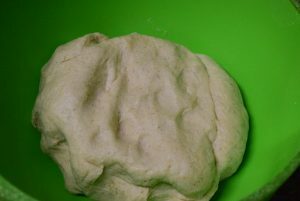 Then add water little by little to make a soft dough. The dough should be soft even without salt or ghee. 3. Cover it and let it rest for 20-25 mins. In the meanwhile preheat the oven to broil. 4. Once the oven is preheated, pinch some pedhas (roundels) from the dough. 5. Roll them with a rolling pin on a board /counter. Roll as many as your baking tray could accomodate. 6. Line the baking tray or sheet with a parchment paper. I kept the two rolled rotis on it. 7. Wearing gloves in hands, gently pull the topmost rack out of the oven. Gently keep the loaded tray over it. Slid it back slowly back to its position. 8. I arranged my rack on the second level from the top. 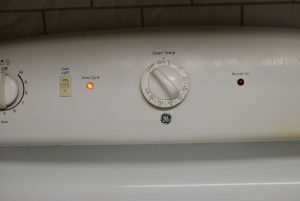 That is the best position for baking naan/roti in my oven at broil settings. You choose according to your oven. 9. Keep an eye on the rotis , since they burn quickly. After about 1 minute, you will see them puffed up fully with some brown spots. 10. Slip your gloves, and gently pull them out, flip them over and keep them back again in the oven. Or you can use a roti/papad net on your stove too. So if your net is already preheated with your electric coil, cook the uncooked side first and then cook the other side ,if needed. 11. Smear ghee on the top side and serve it hot. 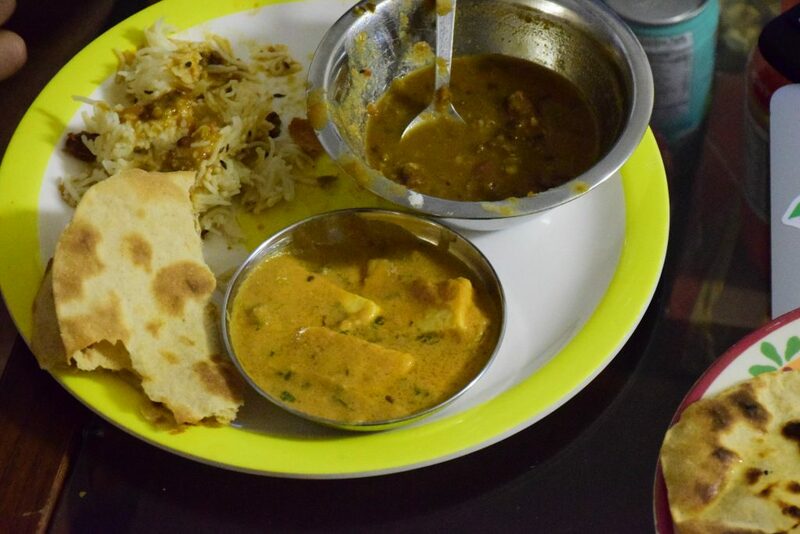 This roti will double your taste if served with “Paneer butter masala” and “Dal Makhani“. 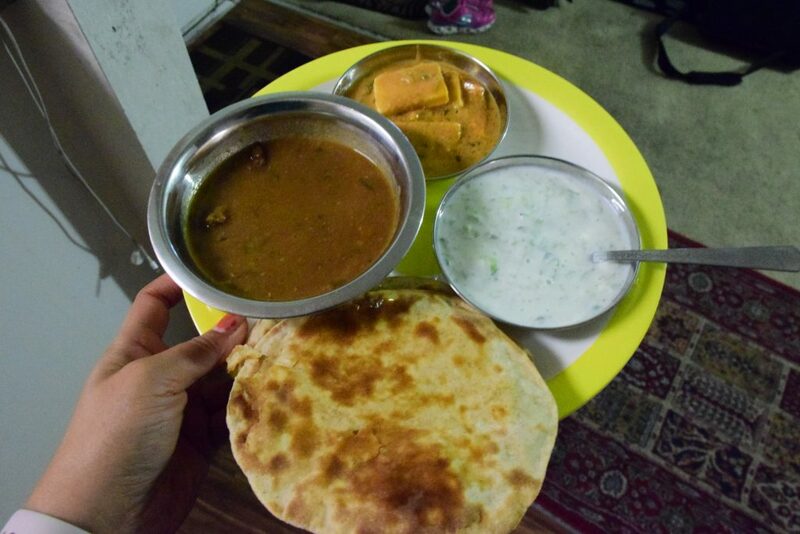 I served it with both of these gravies with a side of kheera-raita (yogurt with grated cucumber) and rice. Hope this recipe gives you another reason to enjoy your weekend !! Till then keep cooking and sharing.. Sometimes food gives you satisfaction, sometimes it gives you solace. Sometimes it kills ur hunger,sometimes it radiates love. 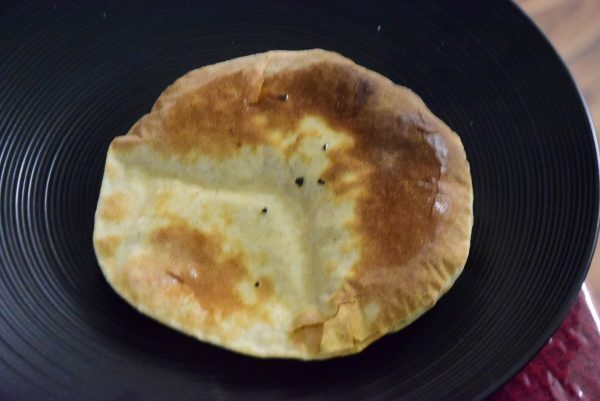 Whatever it takes, this "tandoori roti" has always been my favourite restaurant pick from the menu. But after trying it at home for the first time, I realized that I don't need to plan a dinner date with family or friends and then wait for my order to arrive on our table. 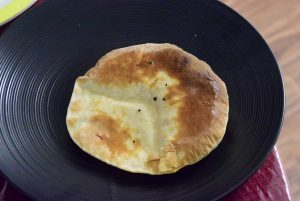 This "roti" would give your dinner a special touch with gentle work. Really , no pains and Full gains !!! I made this for my family and a special friend at home today. Hope you like this doable recipe and try out in your home soon. So lets check it now.. 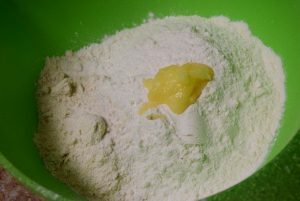 Mix the flours in a bowl / tureen (paraat). You may use plain maida or plain atta too depending on your preference. Add salt and ghee if desired. Then add water little by little to make a soft dough. The dough should be soft even without salt or ghee. Cover it and let it rest for 20-25 mins. In the meanwhile preheat the oven to broil. Once the oven is preheated, pinch some pedhas (roundels) from the dough. Roll them with a rolling pin on a board /counter. Roll as many as your baking tray could accomodate. 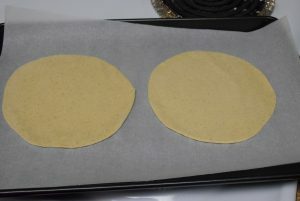 Line the baking tray or sheet with a parchment paper. I kept the two rolled rotis on it. Wearing gloves in hands, gently pull the topmost rack out of the oven. Gently keep the loaded tray over it. Slid it back slowly back to its position. I arranged my rack on the second level from the top. 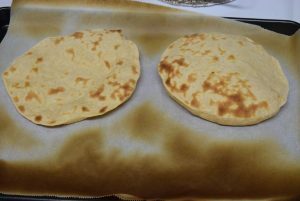 That is the best position for baking naan/roti in my oven at broil settings. You choose according to your oven. Keep an eye on the rotis , since they burn quickly. After about 1 minute, you will see them puffed up fully with some brown spots. Slip your gloves, and gently pull them out, flip them over and keep them back again in the oven. Or you can use a roti/papad net on your stove too. So if your net is already preheated with your electric coil, cook the uncooked side first and then cook the other side ,if needed. Smear ghee on the top side and serve it hot. 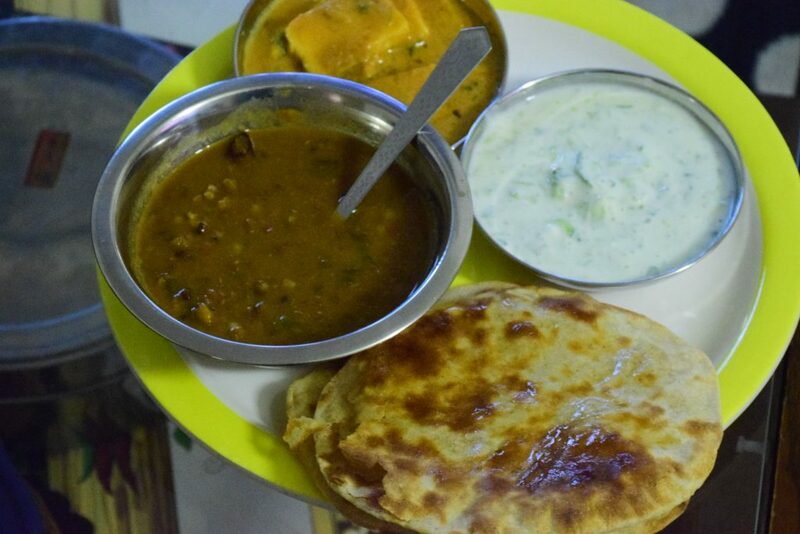 This entry was posted in Food, Main Course, Recipes and tagged Carenshare, creamy paneer, dal makhani without onions, Desi paneer, Dhaba special, in oven, indian staple diet, kids favorite, Light and delicious, main course, no baking powder, no baking soda, no bloating after eating, no curd, no onion no garlic recipe, no pain full gain, no rise time, no work load, no yeast, no yogurt, North-Indian specialty, paneer butter masala, roti, shahi paneer without onion, shweta jindal, weekend brunch, weekend dinner, without tandoor, zindagisikhati.